Although the ‘Rolex President’ name is most often used to refer to men’s Day-Date watches, there are indeed Rolex Ladies President watches too. Lady President watches are special Lady-Datejust watches fitted with Rolex’s famed President bracelet. Let’s have a look at some gorgeous examples in 18k gold. The “Rolex President” name doesn’t just refer to the men’s Day-Date watch. The only difference between a regular Lady-Datejust watch and a Lady President is the bracelet. Therefore, Ladies President watches are simply either Lady-Datejust 26 or the Lady-Datejust 28 watches with President bands instead of Jubilee or Oyster bracelets. The President band was first introduced in 1956 on the then-new Rolex Day-Date watch. Characterized by the semi-circular shape of the links, the President bracelet is an absolute Rolex design icon. 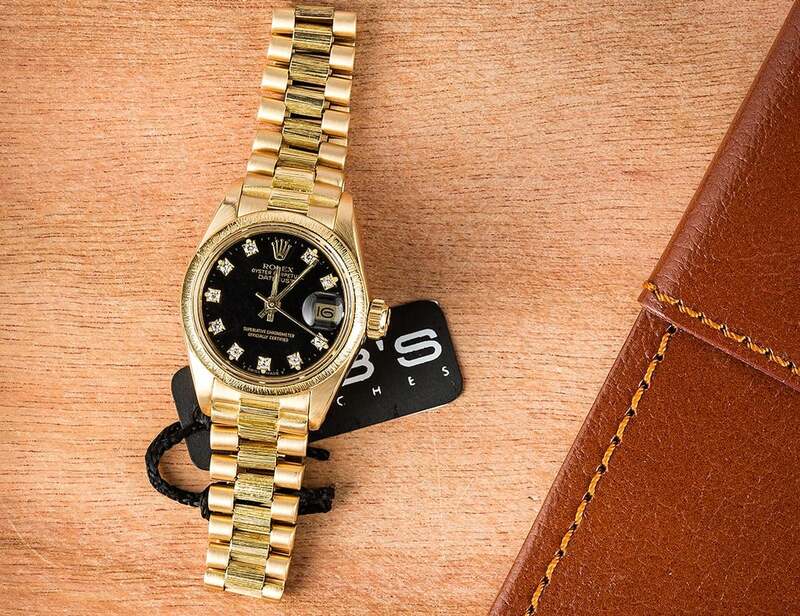 While it was initially developed for the Day-Date, Rolex began offering the President bracelet as an option for precious metal editions of their women’s Datejust watches starting sometime during the 1960s. 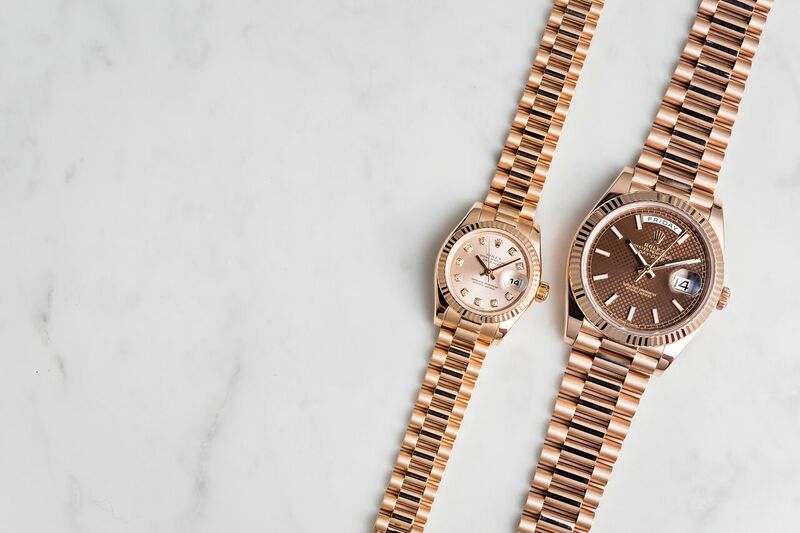 His and Her Rolex President watches in Everose pink gold. As a Datejust watch, the Ladies President, of course, includes the signature date window on its dial along with the accompanying Cyclops magnification lens on the crystal. Rolex used to make the Lady-Datejust watch with 26mm Oyster cases until 2015 when the Datejust 26 was discontinued in favor for the Lady-Datejust 28. Not only does the new generation of the Lady-Datejust include larger 28mm cases, but the new watches also run on the Caliber 2236 automatic movement, which offers an increased power reserve of 55 hours. Like other watches that use Rolex’s proprietary Everose gold, the pink color of this ref. 114866 Ladies President will never fade. 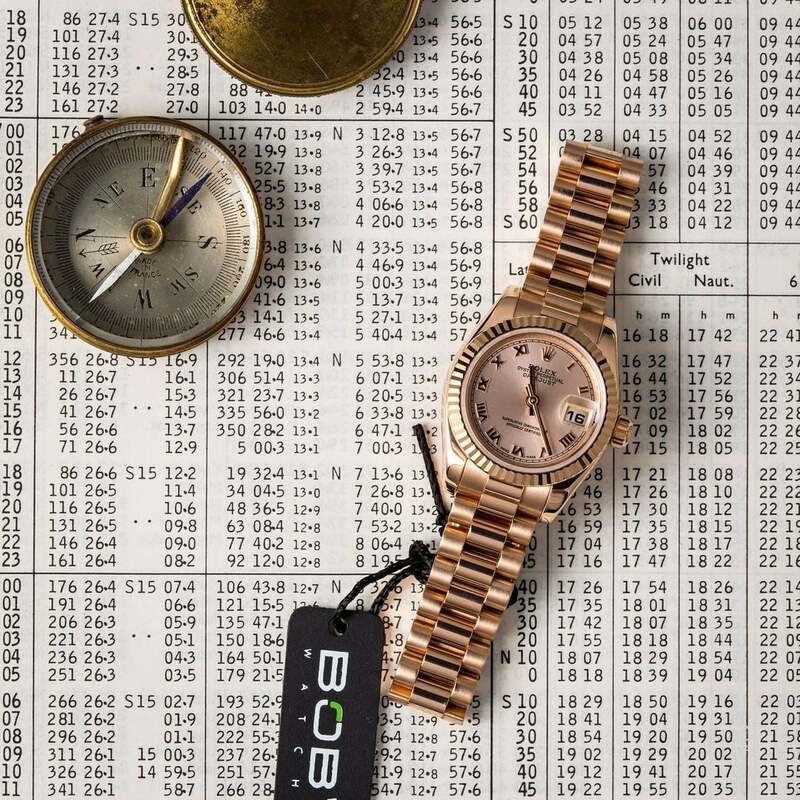 Just like the men’s Day-Date President watches, Rolex Ladies President watches are exclusively available in precious metals, whether in solid 18k gold or 950 platinum. And for the gold versions of the Ladies President, Rolex makes them in all three shades: yellow gold, white gold, and Everose (rose) gold. Bezel options for the gold Ladies President range from classic fluted to dazzling diamond-set. There are even some vintage versions with bark-texture bezels (and matching bark accents on their President bracelets). Similar to all Datejust watches, the Ladies President collection offers a vast array of dial options including neutrals like black, white, and champagne, as well as intriguing stone dials made from materials such as meteorite, lapis lazuli, coral, and onyx. 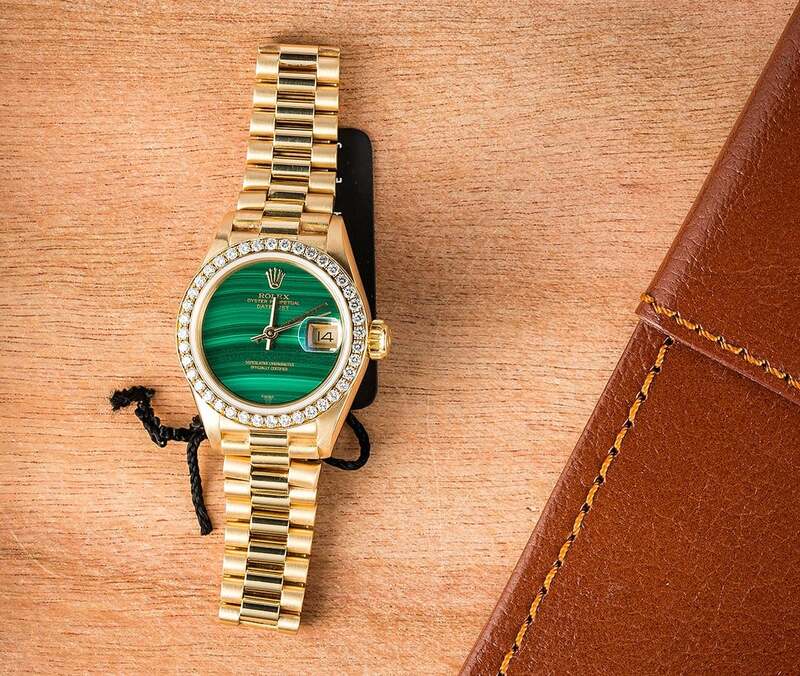 Naturally, the Rolex Ladies President collection offers plenty of diamond dial designs too. A vintage Rolex Ladies President ref. 6927 with bark-textured accents. 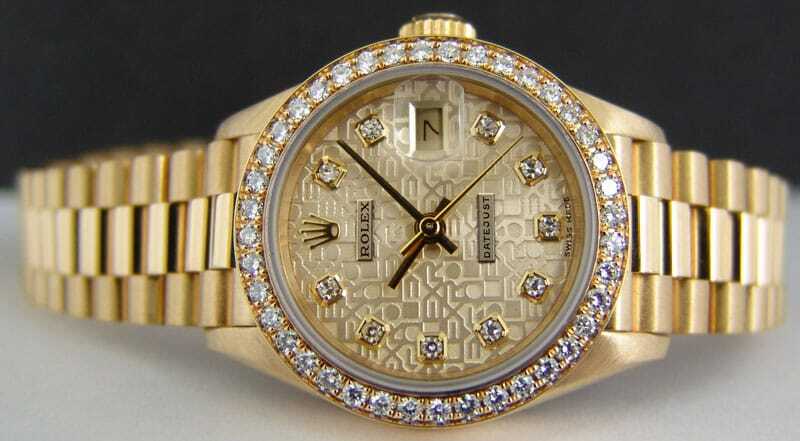 Among all of Rolex’s women’s watches, a gold Ladies President is an especially luxurious option. By pairing the landmark Lady-Datejust watch with the iconic President bracelet, Rolex created an elegant women’s luxury watch that will forever remain a classic. This Lady President has a malachite dial and a diamond-set bezel.